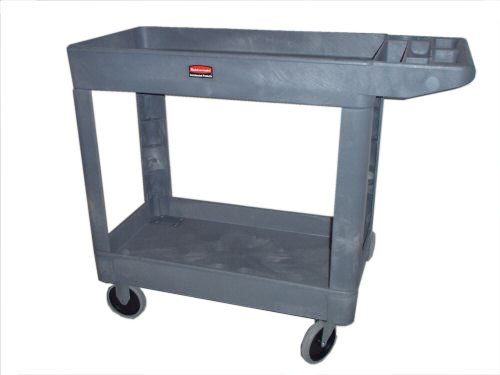 Heavy Duty Utility Cart / Service Trolley by Rubbermaid. Perfect for transporting equipment and heavy loads in any environment. Heavy duty plastic which wont rust, dent, chip or peel. Two tray style shelves, cup holder and storage slot. Ergonomically designed handle provides optimum hand placement and push height improving control and safety. Molded-in storage, holsters, hooks, and notches. Easy-access bottom shelf. Non marking castors, easy & quiet to manoeuvre. Dimensions 845mm high x 997mm long with a shelf width of 454mm. Brand New & very easy to assemble.